Corn season seems to be running later than usual this year. Maybe this is one of the effects of global warming? 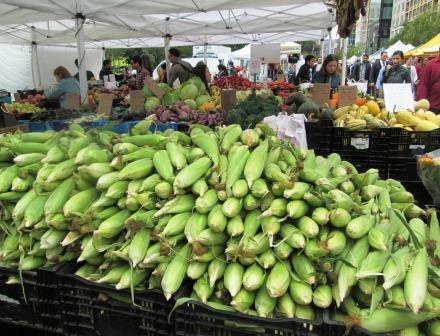 Past the middle of October, my local greenmarket still had lots of corn. I couldn’t resist one last fresh corn indulgence, so I bought some. These late ears weren’t as young and tender as high summer corn, so I browsed my cookbooks for recipes with interesting accompaniments to the main vegetable. Where corn originated seemed a likely place to look, and, sure enough, the Cooking of Latin America volume of the Time-Life Foods of the World series offered several promising possibilities. I chose Humitas. 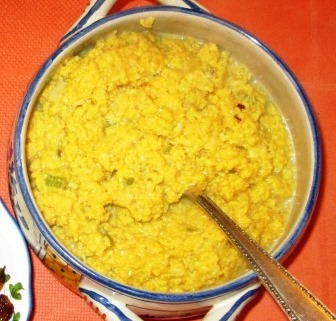 Humitas, I learned, is a standby of many South American countries, and the name is given to a large range of related dishes that derive from Andean Indian traditions. 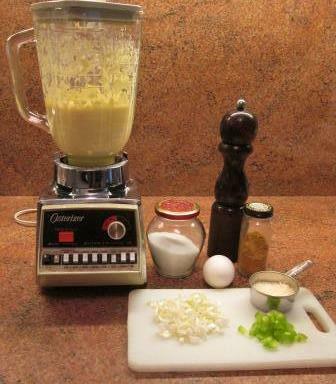 This recipe is an Argentinian one, translated as Pureed Corn with Scallions, Green Peppers, and Cheese. It particularly interested me for two reasons. First, unlike most versions of the dish that I’ve explored online for comparison’s sake, it isn’t steamed or boiled in corn husks, like a tamale, but is sautéed. Second, the scallions, green peppers, and cheese that it includes were just the kind of thing I was looking for to pep up my late-season corn. In the afternoon I scraped the kernels off four ears of corn and pureed them in a blender, along with a little milk. 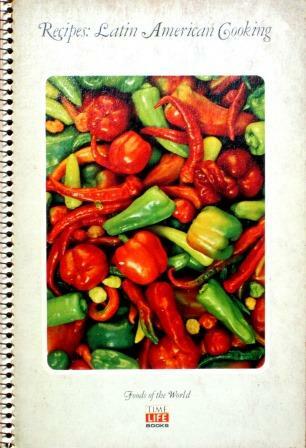 (The recipe’s specification of a blender is a hint to the age of the cookbook. I’m sure I could have used a food processor instead, but I do have a blender, and I wouldn’t want it to think I don’t care about it any more.) Then I added an egg, a teaspoon of paprika, salt and pepper, and blended that in. It made a velvety puree, which sat peacefully on the kitchen counter until called for. Toward dinnertime, I softened some chopped scallions and green pepper in butter in a skillet. I poured in the corn mixture and simmered it for just about five minutes, until it thickened a bit more. Finally I stirred in grated Parmesan cheese (which I guess has become a Pan-American ingredient now), which melted in nicely. It came out looking very like soft scrambled eggs! The flavor was definitely corn, though, and very tasty, though milder than I had been hoping for. When I make it again – and it can be done with frozen corn, the recipe says, so I don’t have to wait for next year – I’ll increase the quantity of the other ingredients, because they worked so well with it. Maybe add some cayenne too. I’m sure the corn could hold its own among the other flavors. In fact, since the scallions and green peppers had smelled so good as they were sautéeing by themselves, I prepared more of them to serve alongside the humitas. 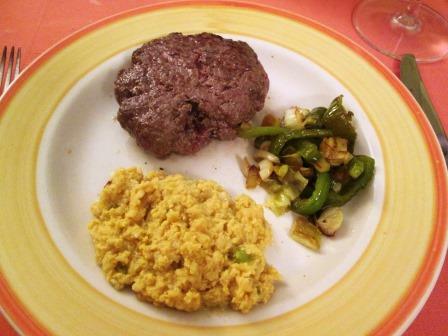 They all made an excellent combination with the simple sirloin burgers that we had for dinner that evening. This is a vegetable dish that will work well with any simple broiled or grilled meat – maybe even fish.